Lady Jane Grey (October 12?, 1537 - February 12, 1554) is not normally counted in the list of British monarchs, but she was, technically, Queen of England for a few days in 1553, and is sometimes known as "The Nine Days' Queen" (July 10 - July 19, 1553) or, alternatively, "The Thirteen Days' Queen" (July 6 - July 19, 1553)-- owing to uncertainty as to when she actually succeeded to the throne and was deposed. The day of her predecessor's death (July 6)_ and that of her official proclamation as Queen (July 10) have both been considered the begining of her short reign. Jane was born in October 1537, the eldest daughter of Henry Grey, 3rd Earl Grey. October 12 has been suggested as a date of birth.Her claim to the throne was through her mother, Frances, Countess Grey, who was the daughter of Mary Tudor, a daughter of King Henry VII of England, and her second husband, Charles Brandon, Duke of Suffolk. Frances was still living but renounced her claim on the throne in favour of her daughter. The question of the succession had arisen as a result of the religious unrest that had prevailed during the reign of King Henry VIII of England. When Henry's heir, Edward VI, died at an early age, the next in line to the throne was his sister, Mary. However, Mary was Roman Catholic and looked set to overturn the religious reforms of her brother's short reign. Fearing religious intolerance, a faction led by the Duke of Northumberland sought a Protestant heir, and fastened on Jane, who had been married off to Northumberland's son, Guilford Dudley, during 1553. 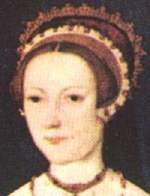 Mary proved to have more popular support than Jane, partly because of the continuing sympathy for the treatment her mother, Catherine of Aragon, had received at the hands of Henry VIII. After Jane was deposed, there seemed some likelihood that her life would be spared by Mary, who had now taken the throne as Mary I. She sent John de Feckenham to Lady Jane, in an attempt to convert her to Catholicism. However, Mary planned a marital alliance with Spain, and the Spaniards insisted on Jane's execution, which took place on February 12, 1554.